But technology has to be available to everyone to be a level playing field. Remember the 1972 Olympic pole vault controversy? Bob Seagren won the gold medal in the 1968 Mexico City Olympic pole vault. In 1972, he had vaulted a world best 18 feet 5.75 inches that year using a carbon pole. The IAAF ruled that the pole was illegal shortly before the Olympics. Seagren and other vaulters protested, and the ban was lifted four days before competition was to begin. However, the night before the qualifying round, the IAAF once again posed the ban and “illegal” poles (nicknamed banana-poles or Cata-Poles) were confiscated. Forced to vault with an unfamiliar pole, Bob Seagren still managed to win a silver medal with a vault of 17 feet 8.5 inches. Yes, I still remember Bob Seagren on the TV sitcom “Soap” in 1978 where he played a gay football player in a relationship with Billy Crystal. Does anyone else remember that show? Not everyone can be like Jeremy Wariner with asymmetrical custom made spikes. Nike’s USATF uniforms feature the new Nike “Swift” materials which reduces weight and has less aerodynamic drag. Nike claims the new Nike Swift Suit translates to a benefit of about .02 of a second in the 100m. Sanya Richards was wearing this suit at the 2008 USATF Olympic Trials. You can’t assume this suit will shave 0.08 seconds in a 400 meters because the maximum speed of a 100m sprinter is much faster than a 400 meter runner. As for the spikes, it is interesting to note that the spikes are lighter than Michael Johnson’s famous gold spikes from the 1996 Olympic Games in Atlanta. How is that possible? Here is the article from The Financial. READ Which is Better? 3x300 or 2x350 Speed Endurance Workouts? Nike athletes, including Lauryn Williams, premiered Nike’s USA Track and Field (USATF) uniforms, which will be worn by members of the 2008 Olympic Team for Track & Field, before a sold-out crowd of 20,000 fans at the University of Oregon’s historic Hayward Field during the U.S. Track and Field Olympic Trials. Nike was born in Eugene, Ore. and first introduced its iconic Swoosh on Hayward Field at the 1972 U.S. Olympic Trials. Over 30 years and hundreds of medals later, Nike continues to innovate for the world’s top athletes. Nike’s USATF uniforms feature new Nike Swift materials, reducing weight to achieve less drag and faster times, and also include Nike Aerographics and the “We the People” graphic. With seven percent less drag than the Athens version, wearing the new Nike Swift Suit translates to a benefit of about .02 of a second in the 100m. The Nike Swift System of Dress lets athletes customize what they’re wearing while increasing aerodynamic advantages on key parts of the body. Socks, gloves and arm coverings an entire system of dresses were developed by Nike so sprinters could run faster. For example, the Nike Swift gloves and arm coverings have dimpled fabrics like a golf ball to cut wind resistance and allow arms to slice through the air faster. In testing, the design team found that compared with bare skin, the gloves and arm coverings reduce drag by 19 percent and the socks by 12.5 percent. The uniform also features footwear with Nike’s industry leading new Flywire technology. Nike athletes Kara Goucher and Bernard Lagat will perform in the Zoom Matumbo, Nike’s lightest distance track spike. Lagat will also wear the Zoom Victory Spike, currently Nike’s lightestmiddle distance track spike. Both shoes are lighter than Michael Johnson’s famed gold spikes from the 1996 Olympic Games in Atlanta. For the first time, Nike is making more athlete innovations available to consumers with footwear such as: The LunaRacer+, LunarTrainer+, Zoom Victory+, Zoom Matumbo and Zoom Victory Spike. Now, every runner can benefit from Nike’s Flywire and Lunarlite technology. This footwear is available to consumers beginning in July and rolling out through October, 2008. So that explains all of these fast 100m times. Don’t work harder just dress better. So if Tyson Gay had been wearing that suit he might have gone 9.57? Wow. So it wasn’t the track that was fast at Eugene, it was the shoes and the suit. @Adarian – Yes, Nike is sending a bad message to the Youth of America. 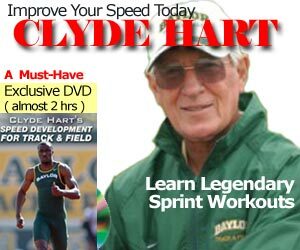 I wonder what Bob Hayes or Peter Snell would run on today’s harder tracks, lighter spikes, and better clothes? How about better training, and better recovery & regeneration techniques? When are people going to be able to purchase a pair of flywire spikes?? I can’t find them anywhere on the internet except in articles….. Please tell me where I could purchase a UK size 5 Ladies pire of shot distance sprint spikes from Melbourne – Australia. What I woudl like to see is of any of the sporting goods & apparel manufacturers would venture into the business wear segment and give a sporty comfort to it. Just liek you have the casual/business sports car that you can drive to any occassion, this, I feel is definitely a segment worth researching. I know every one may not agree but I have some research around this.